Superstorm Sandy has been a devastating experience for many, and will continue to be so for a long time to come. Much of the damage will take weeks or months to repair, and some may take years. A myriad long battles with insurance companies are a given, as the available funds are unlikely to match the damage and there will be many arguments as to what is covered. The impacts are widespread, but unevenly distributed, as the repairs will be. Like Katrina before it, Sandy will be a defining event in the lives of many people. Sandy illustrates a number of important points - how fundamentally dependent modern society is on centralized life-support networks, how interconnected different dependencies are, how crucial the role of energy really is, how disruption in one system can cascade into impacts in many others, and how unprepared people typically are to withstand even relatively short disruptions of essential services. Sandy provides a very useful case study in what we can do to prepare for challenging times, whether those occur due to hurricanes, ice-storms, earthquakes, financial collapse or other possible eventualities. Most people do not realize that their government expects them to look after themselves for several days in the event of a disaster. Here in Ontario, people are expected to cover for themselves for 72 hours before any external assistance can be provided, but this has not been effectively communicated. Most people are not aware, and many with acute dependencies of various kinds could easily be in trouble long before that, especially in a climate that can be very unforgiving. Emergency preparedness has been given far too little attention, meaning that people are far more vulnerable than they should be. Even a small amount of individual preparedness can go a long way, preparation at a family or community level is even more valuable, and well-communicated municipal emergency preparedness plans can make a major difference. 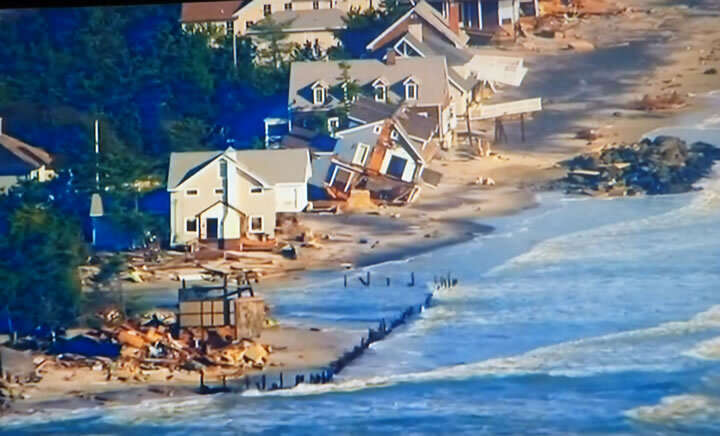 Sandy hit with high winds, rainfall and a major storm surge at an unusually high tide, causing enormous damage to local infrastructure, particularly along the coast and where the surge was funnelled into inlets. Overhead powerlines were downed by wind, falling trees and flying debris, while underground infrastructure was flooded with salt water, transformers exploded and fires (that could not be reached due to flooding) devastated some communities. Power outages affected millions of homes, and also other essential services such as gas stations, food outlets, hospitals, water supply, and communications. People charging mobile devices in public places with power became a common sight, underlining the critical role of electronic communications. Transport was crippled in many places by loss of vehicles, closure of flooded subways, blocking of routes for overland travel, debris blocking the harbour to tanker deliveries, and lack of pumping capacity at gas stations. Gas stations with power were overwhelmed by demand, so that lines hours long formed, stations began to run out and tempers flared. Demand for gas was compounded by people filling additional canisters in order to have a supply cushion for vehicles, but also to run generators compensating for the lack of mains power. Gas rationing was instituted in New Jersey and New York City, limiting even numbered licence plates to even days and odd numbered plates to odd days, in an attempt to ease waiting times. Without adequate transport, providing relief to immobile and vulnerable people is very much more difficult. These people may already have been without food, water, power, heat and medicines for many days before public services can even begin to assess their needs. What we are seeing in affected areas is the extent to which people must look after themselves and each other in times of acute crisis, and what is possible in this regard when push comes to shove. Private initiatives of all scales have been a major part of the immediate disaster relief effort, from individual households with power providing extension cords outside to passersby, families offering to take in others, restaurants providing free meals and gathering places, and big businesses supplying generators and other emergency equipment. Where such measures are offered, they can make a very significant difference, especially in the immediate aftermath where rapid response time can be achieved. In other less fortunate areas - often outer areas where damage is extreme - people are already beginning to feel abandoned in the wake of Sandy. Increasingly worried about looting or other forms of crime, they are arming themselves and posting warning signs amid the debris. The potential for unfortunate incidents is rapidly escalating, and it could be a long time before the public service response makes much difference. Ironically, however, there are indications that crime rates have actually fallen with people relatively immobilized. As useful as private efforts are in terms of rapid response, over time they can develop into a disaster capitalism scenario if left unchecked. Private capital may be able to deliver quicker rebuilding, but if this involves scrapping regulatory frameworks and converting public infrastructure into a private for-profit version, the benefit may not be worth the cost to the public good. The risk is that rebuilding could lead to further scaling up, greater centralization in the hands of the few, erosion of local control and local supply chains. A response weighted towards private initiatives could easily end up providing rapid and comprehensive rebuilding in wealthy areas, while neglecting repairs in poorer neighbourhoods. Getting the balance right between mobilizing all appropriate efforts to rebuild, while providing evenly distributed repairs and not ceding too much control over the results, can be very difficult. The initial attempt to go ahead with the New York marathon did not help matters, as people saw resources such as large generator trucks mobilized to service with event venues that could have been deployed to help suffering locals. Cancelling the race was clearly advisable, but much public relations damage was already done. Angering people under such circumstances increases the potential for antisocial responses that can have cascading effects. A second punch in the form of a powerful, and unusually early, nor'easter has caused significant setbacks for recovery efforts. Many people whose power had been restored have now lost it again. Those without heat are suffering even more in cold temperatures, high winds are threatening further damage to weakened structures, and several inches of snow are adding to transportation woes. Restoring some services is going to be a long term process. Flooded tunnels must be pumped out, but that is only the first step. The salt water will have penetrated any damaged areas and will cause rapid corrosion. This is likely to have a significant impact on the 108 year old subway system for years, until all the affected equipment has been replaced. Powerlines have been downed and must be rebuilt, often in areas that are very heavily damaged in other ways. This too will take a long time. There have been suggestions that powerlines should have been built underground, and there may be pressure to rebuild them this way. This is actually not the panacea one might imagine, and might not have protected the infrastructure entirely from storm damage. Building underground transmission lines is approximately twenty times as expensive as overhead. It involves costly insulated cable instead of simple wires. It sterilizes a much larger land corridor. Faults can be difficult to find and very expensive to repair. Taking this approach would add greatly to the cost and timeframe of restoration efforts. Gasoline supplies should be slowly normalizing, as tankers are now able to bring in supplies. Fuel distribution could be tricky in some places for quite a while though. When people are put into a mindset that supplies might be unreliable, they increase demand in the short term in order to purchase and hoard a supply cushion. This dynamic can persist for some time, meaning that stretched infrastructure and supplies may have to service higher than normal demand while not yet fully restored. Given that gas supplies may be necessary for both transport and generator fuel, increased demand is even more likely. Fuel storage at home can be dangerous, meaning that many people may be running significantly increased fire risk at a time when the ability to deal with fires may be still impacted by storm damage. Supply chains for many goods have been disrupted and may remain so for some time, as supply chains are often very long and complex, and can be broken in many different ways. The effects of shortages of one thing can then rapidly impact on the supply of others. Our just in time supply system, with little inventory to act as a cushion, is particularly vulnerable to cascading system impacts. In the name of economic efficiency, we have created a very brittle system, when it is resilience we need in order to be able to withstand system shocks. Resilience requires safety margins and supply cushions, but these represent a cost that we have been increasingly unwilling to bear. In whittling them away, we have left ourselves far more vulnerable than we once were. Personal emergency preparedness can often take much of the pressure off when disaster strikes. In general terms, it is advisable where possible to have at least two weeks worth of supplies of food, water and medicine on hand, and preferably a month's worth, although this may be very difficult for those with limited means or limited storage space. People unable to prepare much individually may be able to do so to some extent by pooling resources. For high-rise dwellers, a power outage will also mean no water above the third floor, so water supplies can be particularly important. Having emergency cash on hand is also highly advisable, as transport and power problems, both personal and institutional, can prevent people from accessing funds. Carrying no debt beforehand can make a major difference, as getting out of debt removes a drain on resources that could suddenly become much scarcer, rapidly amplifying the burden of debt servicing. In addition, debt servicing may become physically difficult due to lack of energy and transport options. This may lead to financial penalties that add insult to injury. In the case of Sandy, it appears that some financial penalties for late payments are to be waived, but there is no guarantee that this would always be the case. Not everyone will be able to provide a cushion for themselves and others, but the more people do, the fewer will require what overstretched public assistance may be available, meaning that public assistance may be able to get to the more acutely needy more quickly. It is in everyone's interest that those who can implement an emergency preparedness plan do so. Our societies have become too complacent in terms of assuming public systems capable of assisting all in a timely fashion actually exist. This leads to responsibility being passed upwards and largely forgotten, leaving people vulnerable when disaster strikes, and that which had been taken for granted turns out to have been an illusion. Having a supply cushion can make a very large difference to how acute situations play out, especially if a critical mass of people have such a cushion. People without one typically find themselves pitched abruptly into a state of short term crisis management, quite possibly escalating into panic quite quickly. The odds of a constructive and cool-headed response go down when too many people are afraid, and even more so if they are also angry. Both fear and anger are highly catching, and their spread can change the entire way the impact of a disaster unfolds. The human over-reaction, or unconstructive reaction, to events has the potential to cause the majority of the impact in some disaster scenarios. Encouraging people to make simple personal preparations, as some regions and religions already do, can greatly reduce the potential for something like this to occur. If municipalities would inform people well in advance of difficulties of the need to be self-reliant for at least two weeks, and then explained to them how to go about this, much suffering could be averted. There is a misguided notion that doing anything to encourage preparation will cause people to panic and hoard. While it is true that issuing warnings in the immediate run-up to something like a major storm about to make landfall could have this effect, issuing instructions in a calm and measured way when no disaster is actually looming should not cause a collective psychology problem. It can be difficult to strike a balance between motivating people to act and causing fear, but the answer is not to avoid the issue by failing to motivate people at all. Aside from the obvious food, water, medicines and cash, there are many pieces of equipment that could be very useful, most of which are not terribly expensive. Wind-up or solar powered radios can keep people informed of what has happened in their area and what is being done to reach and help affected people. Given that mobile electronic communications are so central to people's lives, solar chargers and small battery back ups could allow people to stay connected. Ordinary batteries and solar chargers for them could keep other equipment functioning. Solar cookers, or coleman stoves with fuel supplies, allow people to cook or heat water without access to normal energy sources. Water filters or purification tablets can provide drinkable water supplies when regular supplies cannot be trusted. Hand tools, work gloves, spare blankets or sleeping bags, candles, matches, flashlights, a first aid kit, bicycles and other basics could be very helpful. Community connections can allow available equipment to be shared, so that many more people may benefit. Establishing a list of residents, noting vulnerable people, would be useful, particularly in highrise buildings where isolation is all too common. The planning process for such a community initiative would be useful in terms of building relationships of trust prior to any kind of disaster, and those relationships would help people to function together later under challenging circumstances. Established local time banks can be a very valuable part of an emergency response capability, as they can serve as a local skills inventory that can be mobilized very quickly. This was demonstrated following the Christchurch earthquake in New Zealand in February 2011. Preparations at a neighbourhood or municipal level also make sense, particularly where there may be large numbers of people unable to prepare themselves. For instance, specific public buildings could be designated in advance as mustering areas in the event of disaster, and these could be equipped with emergency supplies. If people knew to come to a particular community space, and knew that space would be equipped to receive them if necessary, they would feel far more secure. As always, creating a resilience cushion takes resources. An emergency supply inventory and maintaining the space to house it would be no exception, but the expense could make a very large difference in times of crisis. Larger scale relief coordination agencies, such as FEMA, also have a role to play. Well thought out contingency plans, backed up with reserves of supplies, equipment and skilled personnel can help tremendously, although response times for larger, more complex entities are likely to be longer. In an ideal world there would be a top down/bottom up partnership between emergency preparedness plans at different scales, and plans would mesh seamlessly with each other. The reality on the ground is always likely to be rather more chaotic in practice, however. As devastating as storms like Katrina and Sandy can be, there are other possible disaster scenarios that could have longer lasting or more far-reaching consequences. Storms and earthquakes are relatively localized physical events. If they take place at a time when the surrounding areas are functioning normally, then resources can flow in from undamaged areas and recovery in a reasonable timeframe should be feasible, depending on the scale and cost of the damage. In extreme cases like hurricane Katrina, some areas will probably never be rebuilt due to cost and on-going risk of levee failure. Not all disasters are physical and localized. A major financial crash, while not directly physically destructive, can nevertheless be devastating, and can affect whole countries or supranational aggregations at once. Finance is the operating system, and crashing the operating system has significant consequences in a short period of time. Witness Argentina in 2001 for an example on a small, localized scale, and then imagine something similar unfolding across the developed world within a matter of months. The odds of experiencing something of this nature over the next few years are uncomfortably high. Where many, or even most, regions are dealing with acute disruption, resource flow from one area to another is considerably less likely. The need for community preparedness is even greater where larger scale formal arrangements could be completely over-stretched and unable to respond effectively. Independent municipal and community systems would be the fallback, hence the need to develop functional preparedness plans at this level, with the intention of covering a longer period of time than that associated with physical disasters. At the Automatic Earth, our prescription for such an eventuality remains: hold no debt, hold cash on hand, gain some control over the essentials of your own existence and maintain a supply cushion if you can. Think of essential functions (such as cooking or heating your home) and see if there is more than one way to provide for that function. Redundancy confers resilience because it expands the range of potential input scenarios that can be coped with. Anything you can do at the community rather than the individual level would be more useful for more people. Pooling resources not only makes them stretch further, but also builds critical relationships of trust that are the foundation of society. There will probably be a period of time over the next few years when we need to look after ourselves with little or no top down assistance, and for longer than we can currently imagine. We will probably be limited to the local resource base and supply chains far more than we are used to, meaning that we need to become far more aware of what we actually have and do not have where we happen to find ourselves. Building preparedness requires civic engagement at a human scale. It requires working together, compromise and the human skills necessary to achieve it, and above all realistic expectations. It provides an empowering sense of purpose that is the best antidote to depression. That in itself can help to keep people focused on the constructive actions they can achieve, rather than on destructive fear and anger. We need to look at the lessons provided by disasters like superstorm Sandy, hurricane Katrina and the Christchurch earthquake, to name but a few recent examples. Now is the time to learn from these tragedies, so that we can be better prepared to face an uncertain future where limits to growth, and the full range of our modern dependencies, are becoming clearer by the day.